Any person in New Mexico currently employed as a firefighter can apply for the Firefighter plate. Any person who is an active volunteer firefighter with a volunteer fire department recognized by the State Fire Marshal may apply for this plate. 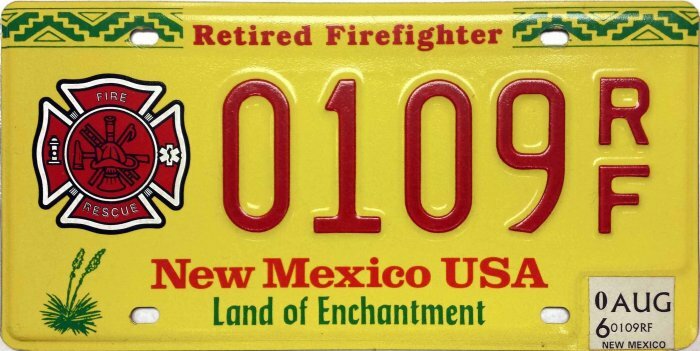 The Retired Firefighter special plate is available to any person who is a retired New Mexico firefighter with proof that the person has retired from active employment as a firefighter. This special plate for emergency medical technicians (EMTs) is available to any EMT who provides proof that he or she is an emergency medical technician licensed in New Mexico. Photo Credits: 2006 Retired Firefighter courtesy George Kunsman. All others by Bill Johnston.